Stuff you stomach full of tacos and get the chance to win a shiny new PlayStation 4 with this latest promotional giveaway. You might remember around the pre-launch for the PlayStation Vita that Sony paired up with fast food eatery Taco Bell for a sponsored giveaway, which rewarded lucky winners with a free PS Vita. Shamefully, and against the safety for my stomach, even I tried my hand at winning one, but alas I came up quite short. As I’m sure did many others. Perhaps we’ll have much better luck this time around, as once again the two businesses have partnered for yet another similar giveaway, particularly focused on the PlayStation 4. 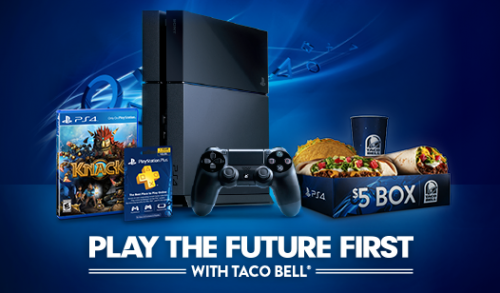 The contest is called “Play the Future First”, and from September 26 to November 10 Taco Bell will be offering a chance to win a PS4 prize pack. The PR release from Sony, in fact, mentions that a winner will be selected every 15 minutes, and the entry process is pretty straightforward, too. All you have to do is simply order one of Taco Bell’s $5 Buck Boxes – which include a Crunchwrap, Crunchy Taco, Burrito Supreme, and fountain drink – which each will come printed with a specially numbered code. From there, just text in the code to the specified web portal, and maybe – just maybe – you’ll win and receive a PS4 three days earlier than the confirmed November 15 launch date for the Sony system. And not just a PS4 console either, your prize includes a copy of the PS4 exclusive platformer, Knack, and a one year membership of PlayStation Plus. All in all, a pretty sweet deal, which you can try your best at winning starting this Thursday, September 26. If you’ve got other queries about this contest, be sure to visit the PS Blog for further info. And if you need more PlayStation goodness in your life – calorie free – then keep it here on PS3Maven for when the Beyond: Two Soul demo drops and the PS4 upgrade plan for select PS3 titles. undoubtedly as if your web-site but the truth is should test this punctuational for many of your site content. A lot of them tend to be rife together with punctuational issues and I still find it quite irritating to make sure the certainty nonetheless I’ll undoubtedly revisit just as before.